How About A 1989 BMW 325i Daily Driver For $3,500? As beloved as the E30 is to many auto enthusiasts, at some point they’re going to become too old to cost effectively use as a daily driver. Today’s Nice Price or Crack Pipe 325i was effectively used as just that, but is its price just too effectively costly? Old Porsche 911s sure do seem to go for big bucks these days - well, except for the 996 edition which is perhaps in that unfortunately goldilocks position of being too new and too full of issues to command top dollars. That extended to yesterday’s 2000 Gemballa Twin-turbo 911 which dropped in a 66% Crack Pipe loss and proving not to be so precious a gem. Until recently Porsche and BMW didn’t really offer competing products. Now they tussle in both the richie-rich SUV ring, and the uber-sedan market, but back when today’s 1989 325i was built, it didn’t have a direct competitor from Stuttgart. Come to think of it, the 3-series of today still enjoys that position. The E30 wasn’t the first 3-series, and several generations have come since it, but it still remains perhaps the marque’s most venerated edition. The thing of it is, the newest of them is 22 years old. With wear and tear at what point will people no longer be able to enjoy these cars as rational daily drivers? This 1989 325i is a prime example of the breed, as well as a microcosm of old car foibles. First off, kudos to the seller; first for seemingly keeping the faith and until recently maintaining this car as a daily driver, and second for offering it in a very detailed ad (and photo gallery) that presents the car in a seemingly honest fashion, warts and all. There doesn’t seem to be any actual warts on the car, however the ad notes that there is some rust, albeit ‘little to none.’ There is also an issue with the A/C, a crack in one of the windows, worn-out tires, a worn out muffler, and what looks to be a leaky front seal or something coating the underside of the engine with a protective layer of engine oil. Oh, and the car has almost 230K on the clock. Okay, that’s most of the bad news, but what about the good, there’s got to be some good, right? Yep, lots of it. First off, the Bronzitbeige paint looks to be completely serviceable, and while there are some cracks in the dash, the rest of the interior has been switched from standard seat beige to sport seat black from a later E36, and it looks pretty sweet. Mechanically, the ad claims the car runs and drives, both important attributes for an automobile, and that it comes with newer Bilsteins, good brakes and… oh just go read the ad. One of the more interesting things in there is the list of additional parts that can come along with the car, and that includes an M106 out of a 745i - the turbo 7-series. How weird is that? 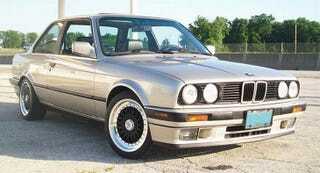 What’s your take on this 325i and its $3,500 price? Does that seem like a deal? These cars are transitioning from desirable old BMW into classic car territory so maybe this is a good opportunity to get on the gravy train. Does $3,500 seem like a fair price to do so? Or, is the seller daily-driving a hard bargain?